Wow, your creativity is amazing. Love every card. All so very nice. Love the rainbow bridge ones. The doggy sympathy cards are so necessary, and your are really sweet. I have a couple of friends who have lost their beloved dogs lately, and I lost mine a year ago. What beautiful rainbow cards. Great April release. The sympathy card is beautiful and I love the sentiments. 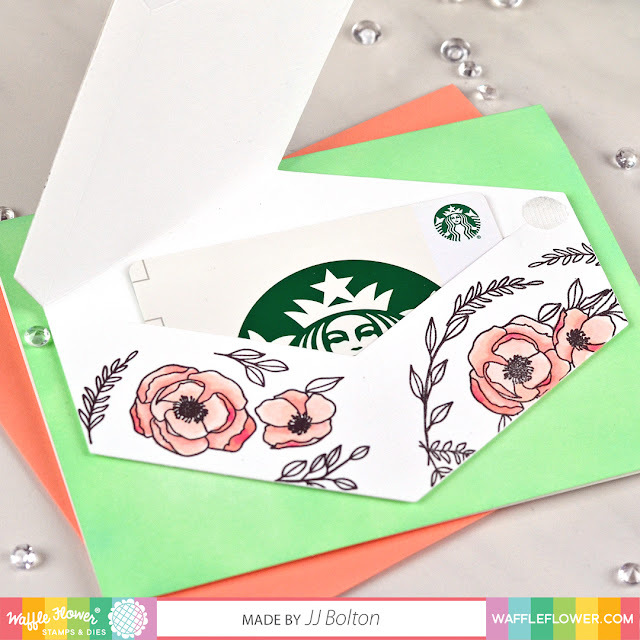 I love the gift card holder card - I am going to try this! 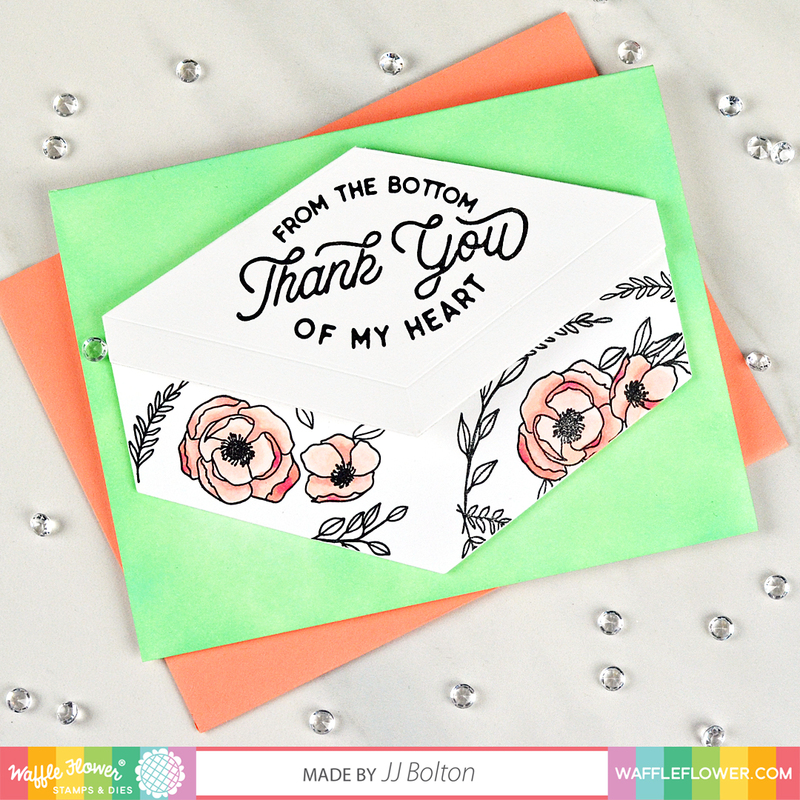 Your use of dies is amazing and there is alot of inspiring ideas you have shared with us! Great cards. Such bright vibrant colors. These are all beautiful, JJ! Love! Wow, so many great cards! 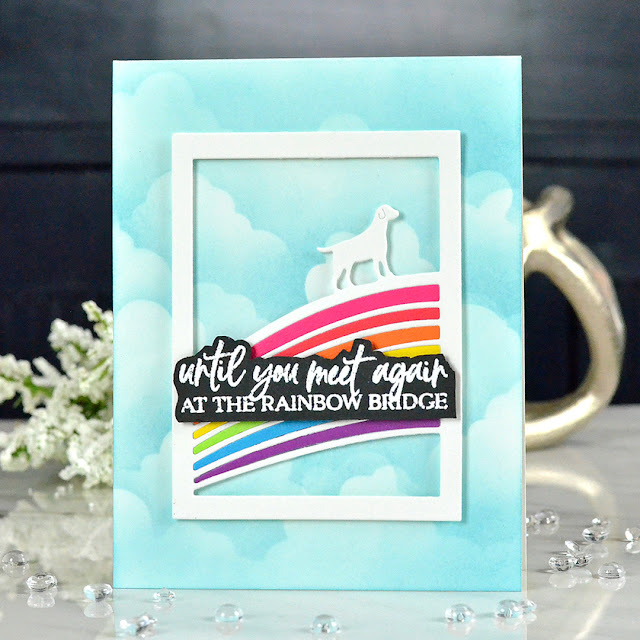 Love all the rainbow bridge card ideas! I love your artwork! Especially the rainbow clouds. Thank you for your wonderful ideas they are awesome! I love all the rainbow ones! It's a great sentiment! 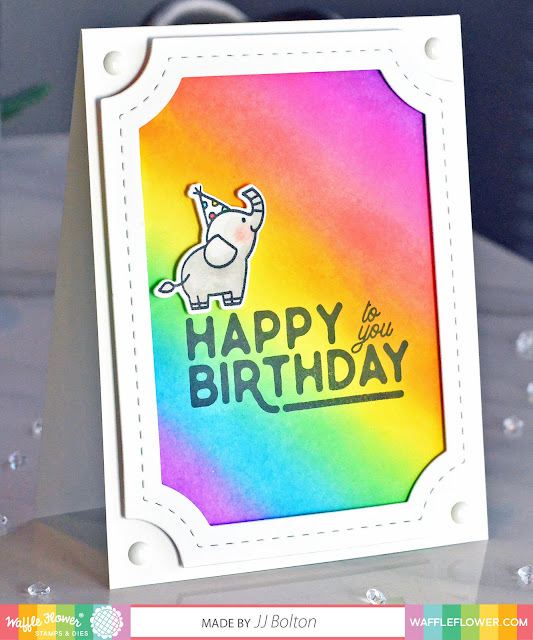 I love your rainbow background card too! 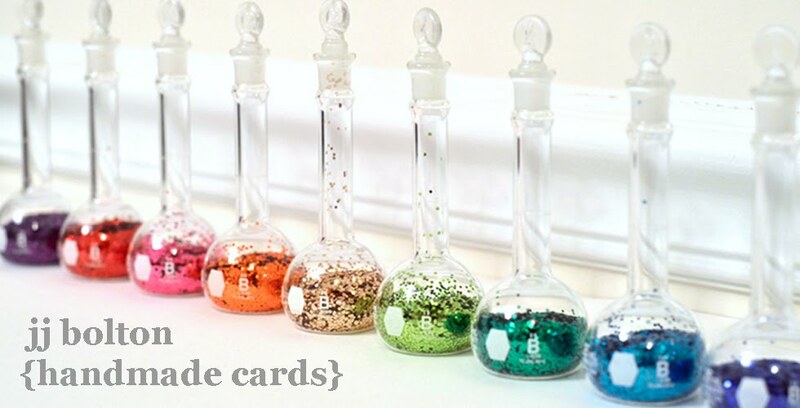 Wonderful cards. I love the colors. WOW...love em all but my favorite is the rainbow cloud sympathy pet card. Thank you for sharing your creations!!! Your Rainbow Bridge cards are my favorite--such well designed "JJ" dies! Awesome cards! 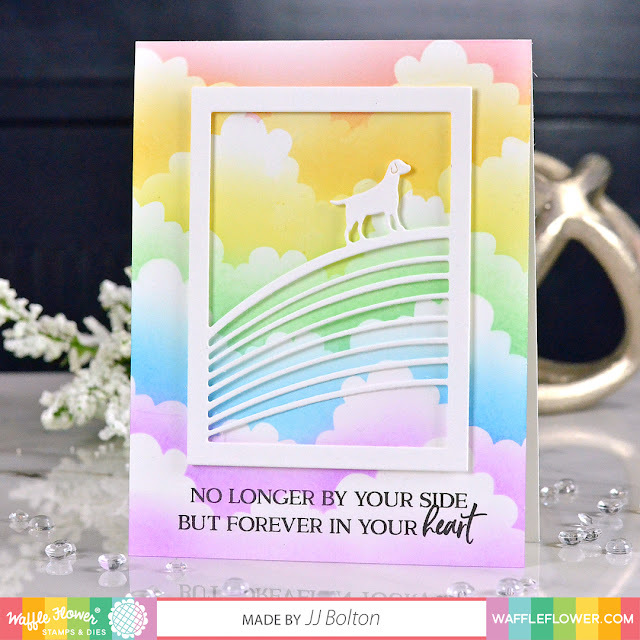 Love the beautiful Rainbow Bridge set and all the cards you created with it! And the kitty in the window scene is just adorable! Super sweet! These Rainbow Bridge dies are so perfect; thanks for creating them. I think my favorite of the cards you shared is the one with the rainbow clouds: clean, simple, and perfect. Thanks for sharing and for all your design contributions! Wow, JJ! I didn't know you did designing now! I've been out of the loop for awhile, but glad now to be back. I love The Rainbow Bridge designs & think we have a need for pet sympathy cards. Beautiful and unique cards! 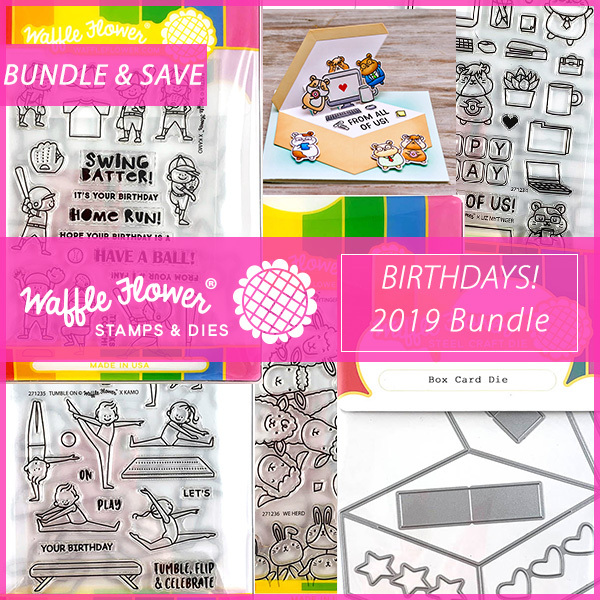 Happy Birthday to Waffle Flower! These are BEAUTIFUL! I love the fun colors of each one! So many gorgeous cards! I like the idea behind your Rainbow Bridge set and cards. Your Be Her card is so cute and true! I love the rainbow brige cards. So sweet. 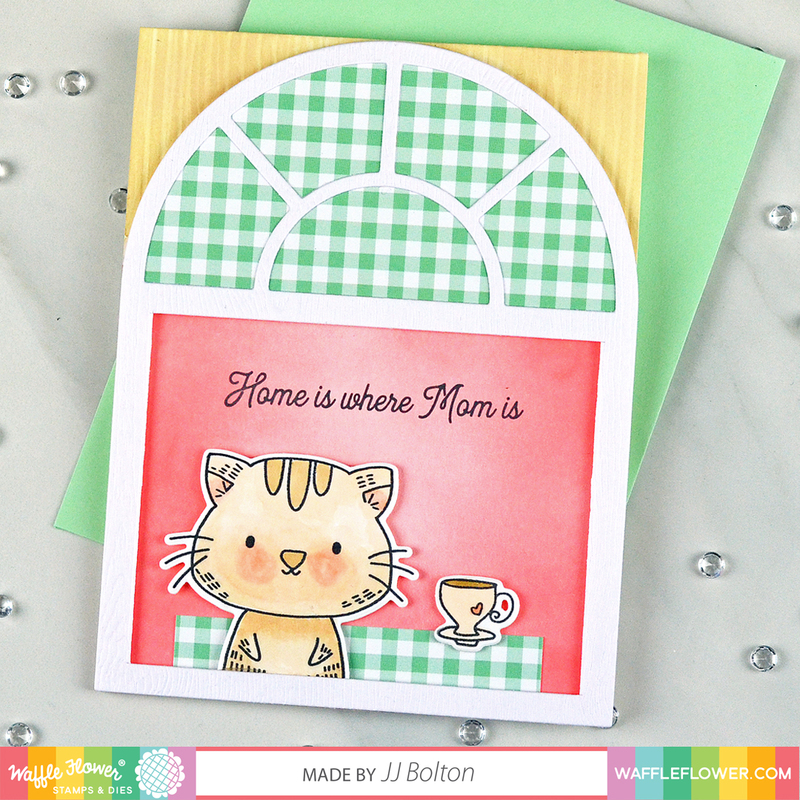 I also love the Be Her card with the kitty. Beautifully colored. Great cards. Love the rainbow of colors. You did such a beautiful job designing the Rainbow Bridge dies! I love the cards you've created using them, especially the rainbow clouds. The "Mom" card with the kitty is adorable, as well! Fantastic cards! Your clouds backgrounds are fantastic! I think my favorite card is the one with the little elephant. He is adorable and I really like this blended background. Love the coler scheme! And your design! in the last of the sympathy cards. Wonderful ways to send sympathy. 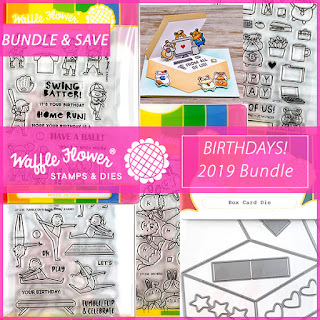 So many wonderful cards, all for very different occasions, but each and every one truly special! Well done, thanks for the inspiration! Your cards are very amazing! Love them all! Wonderful projects, esp. 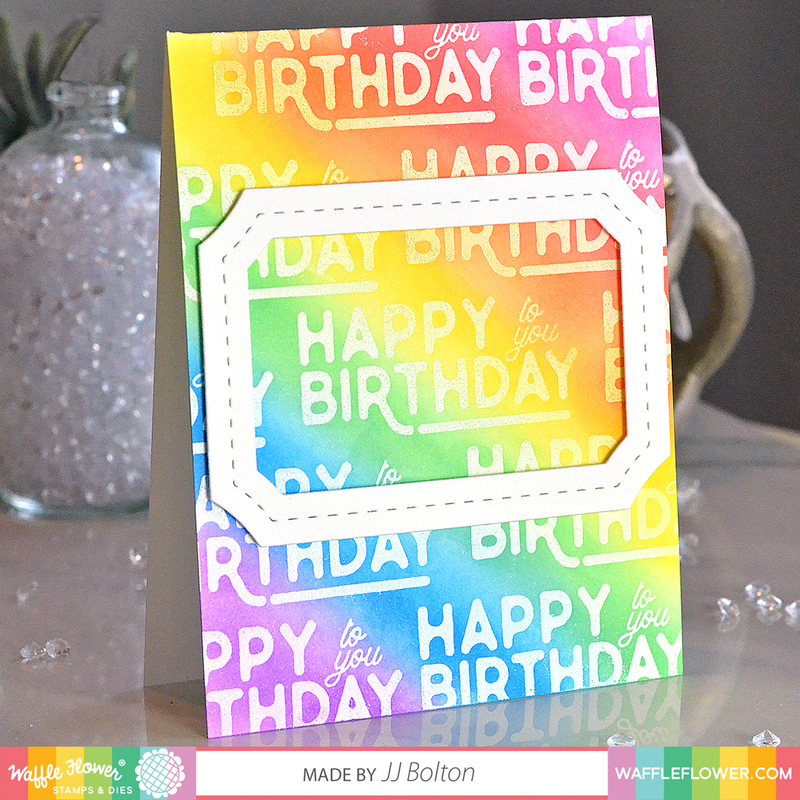 Rainbow Bridge stamp & dog die, so many ways to use the new release. Thanks for sharing.